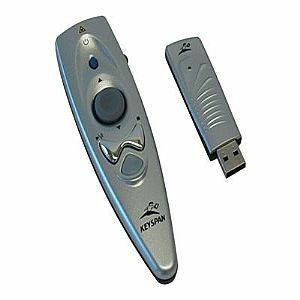 Wireless presentation remote designed for PowerPoint and Keynote. PR-US2 works up to 60-ft away, even through walls and furniture. Provides complete cursor control and two-button mouse capabilities. Wireless Mouse Control! Laser Pointer features "laser safe" design for use in classrooms and other environments where children are present. Media mode controls Windows Media Player on a PC - iTunes and QuickTime on a Mac. The PR-US2 is Plug and Play - there is no software to install. Just plug it into a PC or Mac and it works within seconds.